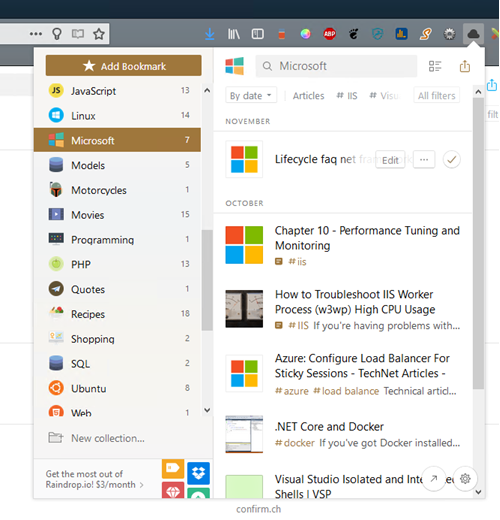 Raindrop is hands-down the best bookmark manager I've ever used. It has a great bookmarklet that snaps into any browser (shown below) and there are Android and Apple apps as well. It's easy to use and lets you tag bookmarks for quick reference. The free version only lets you have one level of categories, but that's been plenty for me. Search for specific text could be better, but otherwise this is a great free utility. I use it at least 10 times a day on either my desktop on my phone. There is a paid version ($3 US per month) that offers a few more features, but so far I'm sticking with the free version. Not because I don't think RainDrop is worth $3 a month--but because RainDrop's tech "Contact Us" won't contact me! I've read a few articles about RainDrop's lack of responsiveness so I am a little apprehensive. So, I export my bookmarks regularly and hope for the best. If RainDrop ever gets back to me I'll make 'em three bucks a month richer. There are tons of database diagramming tools. These tools range in price from free to nearly-the-sky's the limit, all offering various degrees of success and quality. In this crowded market, QuickDatabaseDiagrams (QDD) is a substantial standout. And, at least for the time being, it is free. 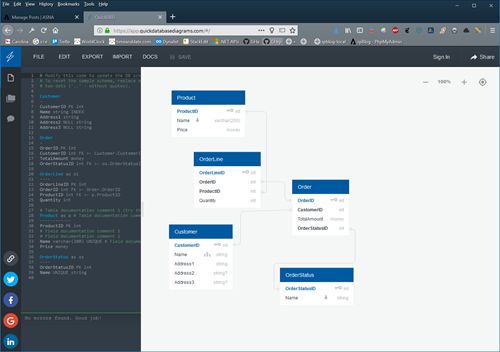 QDD's interesting, and quite effective, the distinction is that unlike fiddly UI-driven, pointy and clicky, database diagrammers (Visio comes to mind), QDD is driven by text. Simple text conventions identify tables, columns, foreign keys, and relationships. After spending about 10 minutes with it, the elegance of QDD's text-based model makes itself very clear. The charts it creates (in real time as you define tables and columns) look great both on screen (shown below) and in resulting PDFs and PNGs. You have control over the diagram and where each table is placed. (You can get a quick overview of QDD with this two minute YouTube video). A downside to QDD is that its import/export capabilities aren't very strong. After exporting a MariaDB database to SQL text, I then imported that file into QDD and it did indeed correctly diagram the database, but changes made in QDD can't be reliably exported back into the database (some database features may be dropped in the translation back to the database). Importing and exporting is available for MySQL/MariaDB, SQL Server, and Oracle. For diagramming existing systems, QDD is perhaps not the best tool. However, its value is that it lets you prototype a new database for a new app very quickly. For this purpose, its export capabilities, while meager, are sufficient. With QDD you at least get a leg up on table and column creation. The SQL QDD generates, could, with little effort, be used to create tables on the IBM i. QDD really shines when you're defining a new system and its entities--especially less-than-database-savvy stakeholders. Regular Joes and Josephines can pull up a chair and easily contribute to a joint design session without getting lost in a fog. All that and QDD is free. Whatta you want for nothing, a rubber biscuit? Udemy offers videos for a wide range of interests, with many being technology-related. Udemy had a few early reputation problems with its content and its author remuneration, but that apparently has been cleared up. The quality of Udemy's videos can vary--so shop carefully. But their prices, usually discounted to $10 or $15 has made Udemy the CostCo of instructional internet videos. The last one, Mohammed Yusuf M's channel, is almost entirely about the IBM i. There are several good IBM i videos, but the channels themselves have very spotty quality. Mohammed's videos are very good, but he desperately needs a better microphone. Still, if you're bringing a rookie to the IBM i, you could do a lot worse than Mohammed's videos. There are always a lot of Black Friday/holiday sales on video subscriptions. I always load up on 'em at this time--the savings can be substantial. Keep your eyes peeled for good deals from many vendors through the end of the year. Also, note that Udemy is nearly always having a sale. If you land on the Udemy site and find a video you need and it's more than $20, wait ten days and check again. Every technical document or article I write starts out as a Markdown document (It was very liberating to tell Word to take a hike!). Markdown is a concise markup, plain-text language that converts easily to HTML. It lets you focus 100% on content with confidence that later the layout and cosmetics will be correct and consistent. If you aren't familiar with Markdown, and especially if your writing leans to the technical side, give Markdown serious consideration. (Learn Markdown online here.). Markdown Monster As a Windows-based fat client ($39 per user), in many ways Markdown Monster (MM) is at odds with the Markdown mantra. Markdown is concise, simple, and direct and doesn't need lots of editing power. A good Markdown editor simply needs core editing capabilities and good conversion to HTML. MM has both of those (with conversion to PDF as well as HTML), but it also has many other features--more than, at least at first, you think it needs. While its heaviness was offputting at first, I later learned to really like MM. It is now my daily writing tool. Markdown Monster is shown below with this article loaded (that is its document preview screen on the right and that panel can be hidden). 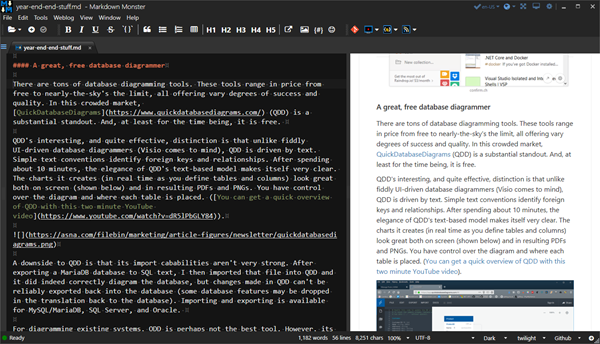 StackEdit.io is a great online Markdown editor. There is a free version, but the $15 per year version lets you store your docs with Dropbox, Google Drive, GitHub and GitLab. While Markdown Monster is my deskbound-editor of choice, when I'm out and about (think waiting at Starbucks for your daughter's three-hour synchronized swimming session to end) StackEdit is a great alternative. What new tools and processes did you adopt in 2018. Let us know in the comments below!